The house now known as 53 Lake Street was once the home of “Squire Holmes” whose father Jonathan Holmes Sr. built it at the time of his marriage to his second wife, Rebecca Tilden in 1752. Although it was a small structure, it was a double house and easily accommodated two families. 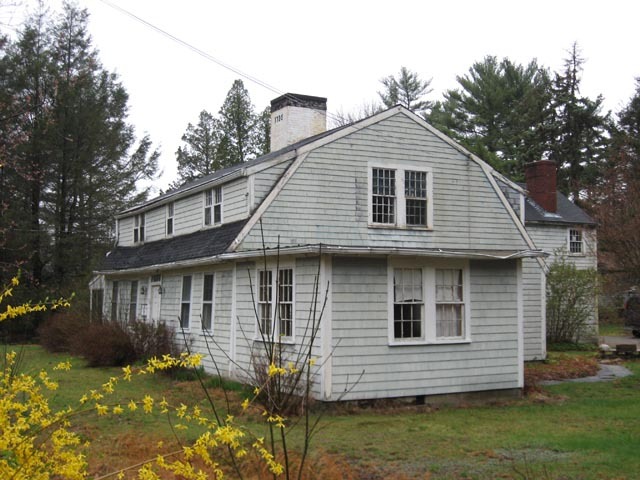 In 1773, “Squire” Jedediah Holmes, son of Jonathan Sr., married Sarah Adams and they moved into this house with his step-mother. Their descendants lived in the house for many generations. The tale is told that Sarah , the “grandmother” to later generations, had planted a rose at the front doorstep when she came as a bride to live in the house. Later daughters of the house took slips of this “white rose of Savoie” from the original to plant near their marital homes, bringing the familiar to the new. The view of 53 Lake Street above dates to around 1890; the one below from April 2008. 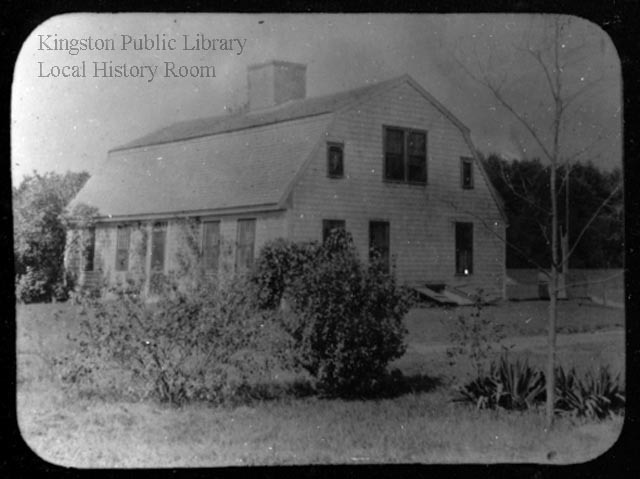 In the newer photograph, despite the additions to both sides and the rear of the house, as well as front and back dormers, the original small structure can still be seen. Source: Lantern Slide card file, Emily Fuller Drew. In the spring of 1898, noted Kingston ship-builder Edward A. Ransom launched the largest vessel constructed on the Jones River since 1874, the steamer Tiger. She was, in the words of Henry M. Jones, author of Ships of Kingston, “a handsome vessel” of 30 tons with an overall length of 53′, a beam of 14′ and a draft of 6′. Here she is moored in front of Ransom’s boathouse, with the Bradford Homestead just up the hill. Ransom and his co-owners, A.J. Hill, C.A. Ransom and H.S. 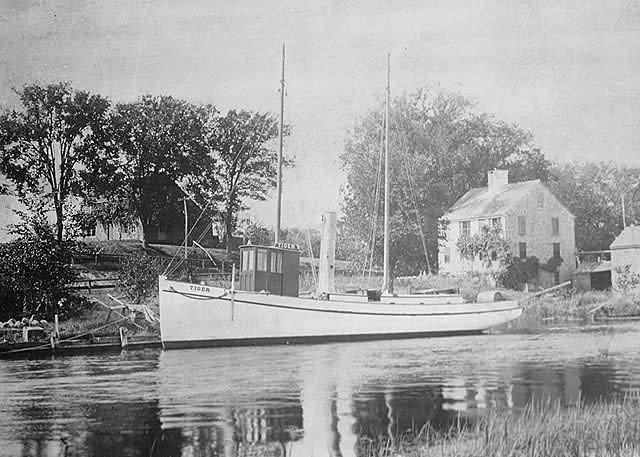 West,* used the Tiger for fishing and lobstering for several years, then sold her to the Churches of Tiverton, R.I., who used her as a porgy steamer. * A handwritten annotation in the archivist’s copy of Ships of Kingston tells us that West was the father of Kingston Town Historian Margaret Warnsman. 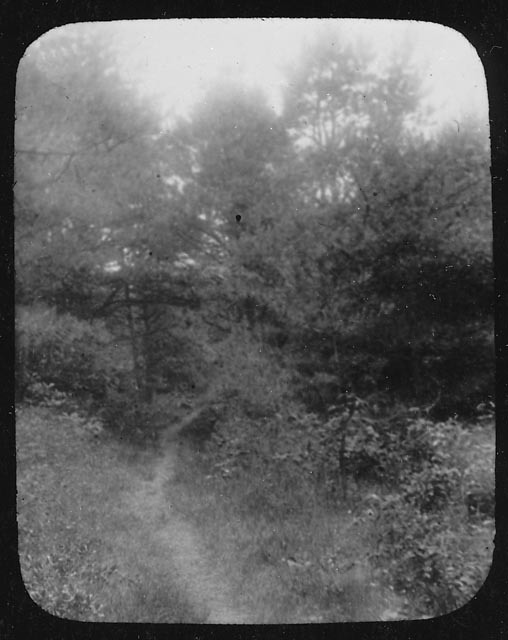 Well before the Pilgrims landed, the Native Americans of southeastern Massachusetts had an extensive network of well-worn trails, among them the Old Bay Path shown in these two lantern slides. By 1637, the colonists had adopted the Bay Path as the main highway through Kingston. Eventually the route became a private road for the Bradfords, then reverted back to a foot path between Stony Brook village (today’s Summer Street neighborhood) and the settlement at Island Creek once the Boston Road (now Summer Street, or Route 3A) was laid out in 1708. Around 1900, the fields through which the path ran were purchased by private interests, the trees and bushes cut down, and a sand pit opened nearby; soon just a vestige of the old path remained. 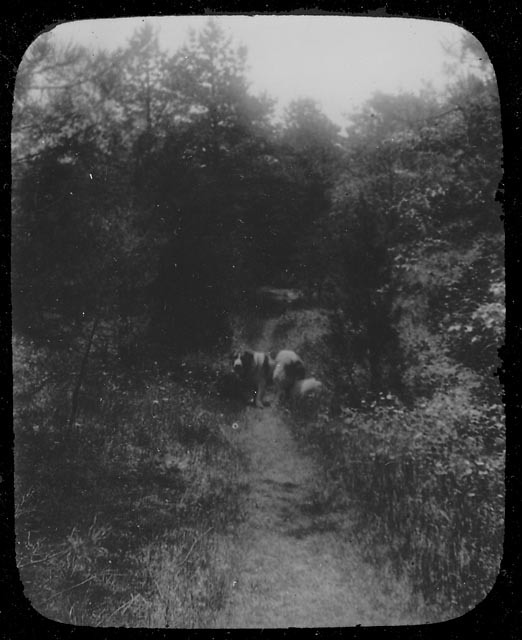 The lantern slide below shows the handsome Old Shiloh on the path. Old Shiloh lived with his mistress Miss Charlotte Cutts on Brewster Road; the path ran close to their home, from the Stony Brook schoolhouse to Miramar. Although the Bay Path connected first the numerous Native American villages, then many of today’s South Shore towns, it began in our town, specifically in what was once the village of the Patuxet, near the present Kingston/Plymouth line. From that point, the path divided, with one branch following today’s Main and Crescent Streets and another going along the shore of Rocky Nook via the present Howland’s Lane to the Jones River. Here the water level determined the method of crossing: stepping stones at low tide or skin boat at high tide. As late as 1900, evidence of this branch of the trail was still visible, crossing the Jones River between the Poorhouse and the boat houses on Landing Road , continuing past the Bailey Playground tennis courts and across the ballfields — once a low, wet area now filled in — up the hill to Summer Street , then over to Maple Street, left at Bradford Road, onto Foster’s Lane and finally along Brewster Road. Other paths intersected the Bay Path here, continuing on to Island Creek and other communities. The Bay Path itself continued along Tarkiln Road into Duxbury near the Tree of Knowledge , running past the Twin Schoolhouse and north to other villages. Little did those Patuxet realize that many years later we would still be using parts of their well worn trail, and even less, perhaps, do today’s travellers realize just how old the roads they follow actually are. Source: Emily Fuller Drew Manuscript Collection MC- 16 2.1 Early Roads and Trails.